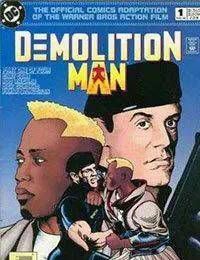 Sylvester Stallone is the DEMOLITION MAN in Warner Bros. science fiction/action adventure film, and DC Comics presents the official comic book adaptation of the movie! The Los Angeles of the near future is a city torn apart by violence, poverty and crime. For criminal mastermind and mass murderer Simon Phoenix, its ripe for the picking. But Phoenix is up against LAPD detective John Spartan, a cop nicknamed Demolition Man because hell stop at nothing to get his man, no matter what the cost or damage. The story begins with a horrific conflagration and the destruction of Phoenixs inner city fortress. Circumstances thrust both men into suspended animation for decades. These two men - foes frozen in time - never imagined that they would once again meet in the year 2032...in a world that isnt ready for either of them.